yesterday afternoon we attended abby's first birthday bash. it's amazing how big she's gotten. we had a great time watching the birthday girl open gifts and play with her balloons, but the highlight was definitely the cake eating portion of the party. 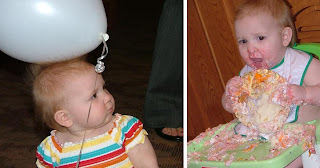 i don't know how much cake she really ate, but she sure seemed to have fun with it. happy birthday abby! and thanks for letting us celebrate with you!